可以描述一下平板進入 Fastboot Mode 模式連接電腦時的狀況嘛 ?! 電腦會偵測到還是 ? 是否可以詳細說明機器類別，還有目前的需求，以及目前你所使用的方法為何 ?! NRT or 手動 ?! 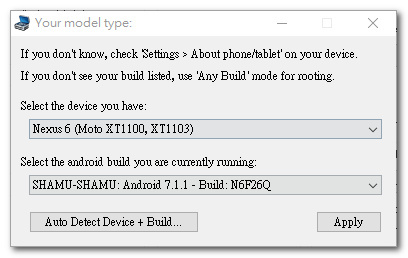 我的NEXUS 7 2013 WIFI已解鎖，直接刷了5.0.1版，執行ROOT，電腦端都有顯示ROOT成功的Script 推送，但是實際上還是沒有ROOT成功耶! 請問我的手機目前是Nexus5 Andorid 5.0, 已解鎖/Root. 如果想要降回4.4.4話要如何設定呢? 這樣會回復原廠設定嗎? 是否可以提供 Nexus 型號 (2013 or 2014) 以及 選擇解鎖功能時出現的錯誤訊息 ?! 請問我執行到FLASH STOCK+UNROOT並選取DEVICE IS ON後便出現DOS視窗並跑一些指令.跑到sending ‘system’ <611886KB>後便停住了很久.平板顯示為FASTBOOT MODE及UNLOCK狀態.拔到USB開機後只停在Google白底黑字畫面.後來在使用Soft-Bricked/Bootloop功能也是一樣其DOS視窗停在sending ‘system’ <611886KB>約2個多小時了都沒有接著動作.按下RECOVERY MODE會出現有著金嘆號的躺著機器人.請問該怎麼辦? "我一直 卡在綠機器人倒地的畫面 只能選Power OFF 和 手動關機 ; 在開機時還是在機器人畫面 , 我該怎麼辦?" 您好，經過您的教學已成功root，但近日想刷回原廠值更新韌體，在usb偵錯模式下 "還原原廠韌體 + Unroot" 這步驟卻一直出現ADB interface not found的message，請問是什麼原因呢? "在關機的狀態下，按住電源+音量下進入 fastboot 模式，然後開啟 NRT，並將要刷入的版本改成 4.1.2，然後勾選 Soft-Bricked/Bootloop，然後按下 Flash Stock + Unroot 試試看 ~ "
我一直 卡在綠機器人倒地的畫面 只能選Power OFF 和 手動關機 ; 在開機時還是在機器人畫面 , 我該怎麼辦? 1.我的 nexus7 在與電腦連接時，沒有出現" 允許偵錯的選項" 沒出現金鑰…. 我手動進去解鎖完了 但在root的時候 平板一直卡在一台綠色機器人平躺開肚的畫面 然後左上角寫著 booting downloaded image…. 請問你在 Root 的時候有選擇 And also flash 然後勾選 Custom Recovery ?! There is no SU binary installed, and SuperSU cannot install it. – consult the relevant forums for your device! There was a problem… that is inproperly rooted. 沒辦法重現你的使用狀況 只好隔空抓藥 http://www.padest.com/forum.php?mod=viewthread&tid=51201 試試看這篇文章說到的方式試試看吧 ~ 另外作業系統是 ? 1.請問您在驅動程式安裝 step.1最後所說的「完成此步驟之後，請重開機，不需要拔除 Nexus 7」,是要重開電腦或nexus 7? backup 始終大小為 0 KB 如何解決 ? 你所指的重刷 ROM 是只刷甚麼類型的 ROM ?! 原廠 還是 ? 我在 Reboot Bootloader 時，出現 "Fastboot device was not fonud.